I first met Ben Sensei in 2007 when he occasionally taught at the Calgary Aikikai. His enthusiasm and expertise left a lasting impression on me, so much so that I joined SAIT Aikido. Ben always focuses on the positive and instils a “can do” attitude among his students. This applies to life’s challenges too and I always find myself reacting in a positive way, or trying to, when things get difficult. He continually emphasizes the practical aspects of Aikido, protecting vulnerable areas and pointing out aspects of the techniques that increase effectiveness. Another compelling characteristic is his bright outlook and happy disposition – life is too short not to be! Lest we forget, we should savour the time on the mat and enjoy the journey. Weapons training with Sensei was certainly an eye-opener for me. I’ve been practicing now for about five years (in US, Indonesia, Japan & Canada) and instantly Ben Sensei made me aware of shortcomings of my technique, areas where I was vulnerable, the importance of timing and real intent. It helped me focus and strive to improve areas of weakness. It guided me back in the right direction. For those of us who have had the privilege of training with Ben Sensei, I am sure we have all benefited in some way from his teachings, whether it be technical and/or philosophical. If you haven’t trained with Ben yet, please consider it an opportunity not to be missed! Congratulations Sensei on your well-deserved promotion to 4th Dan. I have been practicing Aikido since 1988 in Guelph, Ottawa and Calgary. The past five years or so I have been practicing with Ben Sensei and my only regret practicing at Masa Kokoro is that I didn't find Ben Sensei sooner. I never fail to be impressed with Ben Sensei's skill and insight and the man is incurably good humoured! There hasn't been a practice where Ben Sensei was in a grumpy mood or not in the mood to teach. He is always respectful of students, no matter what their level of skill, and he is always respectful of other teachers. The effectiveness of a technique is foremost in Ben Sensei's mind. He encourages his students to practice at other dojos so they can see a technique performed slightly differently or with a different emphasis. You have to make a technique your own. You may be taller, shorter, stronger, weaker or differ physically in other ways from the person demonstrating a technique. You may have to subtly alter the technique to make it work for you. The final arbiter on whether you are doing a technique correctly is whether it is effective for you; can you actually throw this person whether he wants to fall or not... Ben Sensei is always willing to spend time with you to perfect a technique. If you are willing to learn, he is willing to teach. It has been a pleasure to practice with Ben Sensei. I hope to practice with him for many years to come. Thank you Ben Sensei. If I could offer anything it would be that Ben Lim Sensei has done an incredible job introducing me to the engaging world of martial arts and Aikido. His knowledge of both Karate and Aikido are very thorough and he promotes an enjoyable and fun approach to training that also stresses elements of self determination and discipline. Ben Sensei's focus on self improvement lay the foundation for building one's confidence and spirit in Aikido and in life. 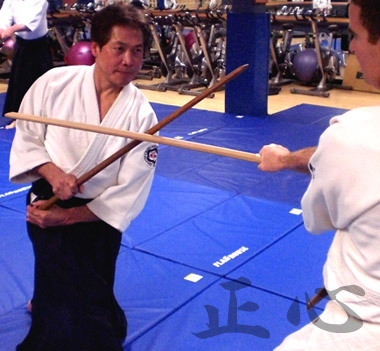 His associations with other dojos in Calgary make for very well rounded approach to Aikido as he encourages training with other Senseis and at various seminars and workshops. Overall my experiences at Masa Kokoro with Ben Lim Sensei have been very rewarding. Ben Lim has always been interested in martial arts since he was a teenager. His curiosity lead him to start Karate in 1979. Upon obtaining his 2nd Dan in Shotokan Karate, he decided to venture into harmonious, flowing arts and thus started training in Aikido with Inaba Sensei from 1987. Ben Lim proudly has his 4th Dan and acknowledges and thanks all those that he has trained with to help promote him to this level. In 2015 Ben Lim was promoted to 5th Dan by the Aikikai. Ben also engages in Tai Chi forms to enable him to have more fluid body movements which are necessary in Aikido. He also believes that ballroom dancing helps with acquiring the basic body movements as well as keeping one’s center. Also, to keep himself extra fit, he engages in energetic Taiko drumming and swimming. Aikido has become his main interest as a martial art form. It gives him fluidity, harmony, and tranquility in life. Ben Lim is retired, and as such he treats his Aikido dojo as a place where he can truly pass on what he has learned, and to help his students find the peace and harmony in their lives as well. He is always at the dojo early, with arms wide and a big smile ready to get started teaching. The practice of Shikko (or “knee-walking”), which has become an integral part of Aikido training, was originally developed when Japanese feudal lords required that all their followers remain on their knees while in the lord’s presence. It later developed into a formal movement in many Samurai ceremonies. Aikido was among the first martial arts freed from the ban imposed on their practice by the US government after World War II. In some areas, Japanese police officers are required to hold at least a Shodan (black belt) in Aikido. We say that Aikido has no competition as this martial art has many dangerous techniques, perhaps more so than any other martial art. Be it the joint or Kansetsu movement or striking or Ate movement, Aikido is exceptional for self-defense and hence has no competition. Due to so many dangerous techniques, no competitions are organized in Aikido as the results could be really dangerous and even result in death. Aikido Photos Aikido Training Schedule & Fees Ben Lim, 5th Dan Dojo Etiquette - Aikido Dos and Don'ts Masa Kokoro Location & Maps Masa Kokoro Promotions Testing Train With Us Get Started in Aikido - Request a Trial Lesson What to Expect at Your First Aikido Class Welcome to Masa Kokoro Aikido Dojo What Is Aikido?